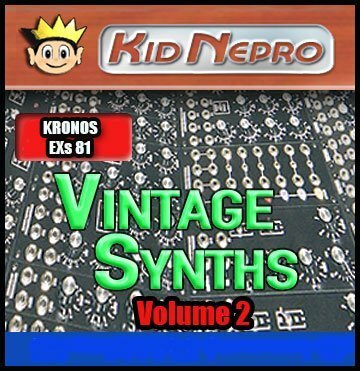 Korg Kronos Volume #10 – Vintage Synths 2 is Kid Nepro’s reply to all our fans who have requested “More Vintage Synth Sounds”. The Patch King has opened his sample vault to reveil only the finest analog synth sounds. Vintage Synths 2 contains 373 Megs of new multi samples with a wide assortment of classic analog basses, leads, pads, strings and killer synths that have that vintage analog sound that many musicians pay big bucks for – now at a fraction of the cost – Only $69. or get All Ten Kronos sound libraries for $369. USD. How do I sample the Magic Man solo (in particular, the “divebomb” sound) into my Korg Krome? I have no clue how to sample, and would need to be talked through the process, step by step. Is ther any way to do this? Does the vintage synths volume 2 offer a vintage Moog sound? I need to be able to bend the pitch an entire octave, and the pitch wheel on the Krome doesn’t do that.